“We’ve got our mojo back,” declares Vodafone UK CEO Nick Jeffery to a room full of journalists and customers at its Newbury headquarters, detailing how IoT, 5G and its converged network infrastructure is going to deliver a platform for UK businesses to thrive. It’s been a difficult few years for the company in its homeland, with challenging regulatory and competitive environments squeezing margins, while its reputation for customer service took a battering after a billing debacle that saw it fine £4.6 million in 2016. But Jeffery is adamant that the difficult work in overhauling its network architecture and internal systems, along with the expansion of its IoT network, mean it is well placed to deliver organisation’s digital transformation projects and consumer’s own demands as the market transitions to 5G. “There is some uncertainty around the world and with Brexit looming there has never been a greater need to close the productivity gap,” he says. “Having a world-class digital infrastructure will help the UK compete and Vodafone UK will play a critical role in delivering that infrastructure. “It should be obvious to those who follow Vodafone that Vodafone believes in the UK. After two years of tireless work and £2 billion of investment – and with £2 billion more over the next two years – you will see a Vodafone with digital in its blood. 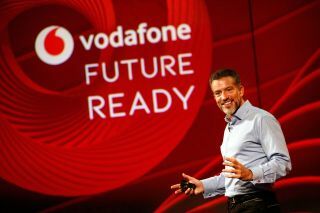 Having been late to the party with 4G, partly through reasons beyond its control like the delayed Ofcom spectrum auction, Vodafone will be a leader in 5G. It is holding trials in seven UK cities and plans to go live in 2019, with coverage extending to the Lake District and Cornwall too. But 5G is only part of the overall picture. Convergence is where Vodafone places the most importance. It has converged its core mobile and fixed networks into a single infrastructure, capable of offering the capacity needed to handle the anticipated growth in data and the resiliency and low latency that will power next generation digital services. This has been done by virtualisation the various functions that comprise the core network so Vodafone can move them around and bring them closer to the customer. Its 3G and 4G networks have already running on Redstream and there are plans to bring its enterprise customers on board too. Vodafone defines convergence as mobile, fixed and IoT with M2M being a key differentiator. The operator has 70 million IoT customers around the world and was a major supporter of Narrowband-IoT (Nb-IoT). The UK is its largest market and Vodafone is well positioned. Eight-five percent of Vodafone’s business customers are connected via the company’s own infrastructure and enterprise market accounts for half of Vodafone’s UK revenue. It’s clear that businesses will benefit the most from 5G and from this architectural transformation. Once enterprise services are migrated, then Vodafone can start to switch off its legacy tools and accelerate its own digital transformation. It has separated its digital elements such as its online shop from the underlying systems of record like billing and CRM so it can be more agile and rollout new services. Eventually, it will be possible to rollout daily updates. This architectural shift is transforming customer services, with Google Assistant integration, Facebook Messenger assistance and its own TOBI chatbot that can handle 32 end-to-end transactions and is even being used internally. And, AI is also being used to predict customer issues before they happen. “When it comes to customer service we haven’t always got it right, but we’ve made improvements over the past two years and we have our highest ever levels of satisfaction,” says Neil Blagden, director of digital and commercial operations at Vodafone UK. Blagden says the first instance of this system being used was to inform customers who had recently changed contract that their first bill would be higher than usual because it covered a longer period. A notification was sent to 55,000 people articulating the issue in clear language and a direct web channel for them to access. This reduced the number of contact instances by a quarter. The use of chatbots and AI should reduce the number of customer agents needed, but Vodafone says it wants a mixture of humans and robots in its contact centres. Instead, it wants its employees to reskill as coders so they can create new digital services based on their understanding of customer needs. 5G will benefit consumers in that they will be able to access faster mobile broadband, but the real opportunity is in business. It is apparent that Vodafone hopes to leverage its legacy as the UK’s oldest mobile operator and its strong likes with the business community to position itself as the ideal transformation partner. This is why it has endured short-term pain for long term gain, overhauling its architecture and laying the foundations for future forms of connectivity. It’s time for that strategy to pay off.